Just as with gold silver prices ended their trading session completely flat as traders and investors wait on the FOMC rate decision and statement (of which the latter will carry far more importance to the markets) due out later today. Overall silver prices ended the session 1 cent up and settled at $14.340 per ounce. 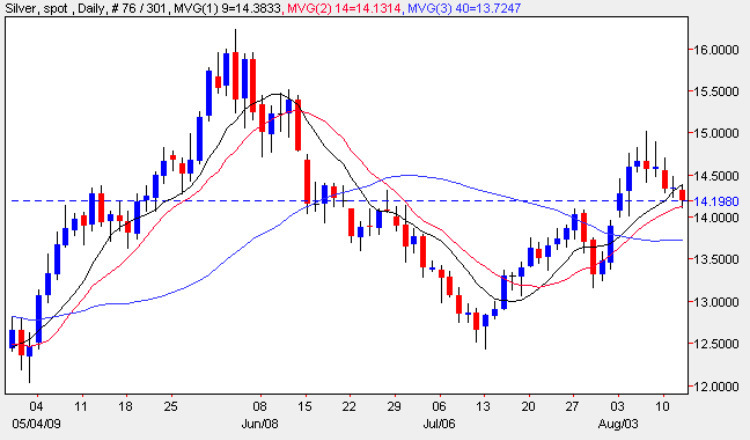 From a technical perspective yesterday’s candle ended the silver trading session perched neatly on the 9 day moving average suggesting that the price of silver may have found of modicum of support. However, with the bearish tone evident in the gold price chart and with the markets now waiting for the FED statement, today is likely to be marked by another session of indecision and drift with prices oscillating around the $14.00 per ounce level. Once the statement has been released and the markets have had time to absorb its contents, hopefully we will have some clear definition and guidance for the price of silver. However, any break below the $13.76 support level coupled with a breach of the 40 day moving average will suggest that the bearish sentiment is set to continue. The short term is bearish, the medium term sideways and the long term bullish.